Clean energy got a big boost this week as Ivanpah, the world's largest concentrating solar power plant, officially started generating energy for California’s electric grid. Located just southwest of Las Vegas, the massive solar facility can produce a whopping 392 megawatts of solar energy to power 140,000 California homes with clean energy--the equivalent of removing 400,000 metric tons of carbon dioxide from the air per year. Despite these impressive numbers, however, Ivanpah has been mired in controversy for its high operating costs and for reportedly killing and scorching alarming numbers of the local wildlife. 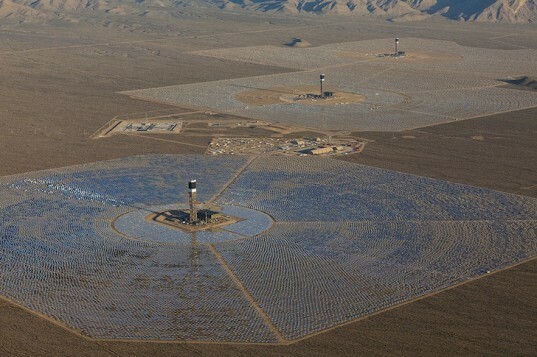 Jointly created between NRG Energy, Inc., Google, and BrightSource Energy, the Ivanpah Solar Electric Generating System is the largest solar project of its kind and accounts for nearly a third of all solar thermal energy produced in the U.S. Stretching across five square miles in the Mojave desert, the massive solar project consists of three 40-story tall towers surrounded by 350,000 garage door-sized mirrors. Each reflective heliostat focuses solar energy onto the boilers atop the towers to create steam to power turbines. 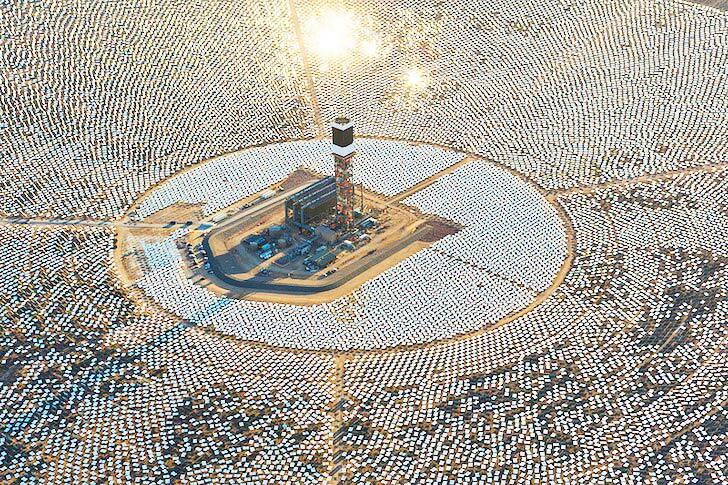 The Ivanpah plant, however, has come under fire by various critics. According to the Wall Street Journal, the clean energy generated by Ivanpah will cost about four times as much as the electricity generated by conventional natural gas-fired plants. Ivanpah will also produce less electricity than conventional sources and require more land to operate. Animal activists have also been alarmed by the number of birds that have been scorched and killed around the solar plant towers, which can generate temperatures as high as 1,000 degrees Fahrenheit. Now its time to convert salted water to fresh water at a little cost . so we can overcome the water shortage. İts time you learn to use metric system . What the hell is fahrenheit.?? It's not perfect, but it's a start. the original computer was the size of a house, now look at the size of the technology we have. you need to start somewhere in order to improve on the technology. I think it's a wonderful start, and it can and will only get better. Can limit the amount of space they are using if they flipped and modified Hubble telescope to blast sunlight onto the direct area. Plus they would need thicker solar panels. Its really a big achievement. Plans must be implemented to convert current present coal thermal plants to solar thermal plants. Poor birds probably think it IS a source of H20 - what a mirage that turned out to be! A coal plant has three basic costs, the cost to build, the cost to maintain and the cost of the fuel it burns. A plant like this has only two, the cost to build and the cost to maintain. There is no cost for fuel. I'm dubious of claims that a plant like this costs too much. They will have to explain why it costs too much when the fuel is free. I seriously doubt the land this takes up is any comparison to the land that is strip mined for coal. While the plant itself may kill more wildlife than a conventional coal or natural gas fired plant, when you take into account what the enviromental damage done by coal mining and fracking I wonder if this project is actually much more enviromentally friendly? For intance, nearly 200,000 people have been ithout drinking water for about month nlow because of the spill of toxic chemicals used to clean coal into a river near Charleston, WV. I'm pleased the the united States is pursuing this technology given the energy countries like China and India are investing in solar and alternative energy cources. Ivanpah stretches across five square miles of the Mojave desert. The massive solar project consists of three 40-story tall towers surrounded by 350,000 garage door-sized mirrors. Each reflective heliostat focuses solar energy onto the boilers atop the towers to create steam to power turbines. Ivanpah can produce a whopping 392 megawatts of solar power, which is enough electricity to power 140,000 California homes with clean energy. Critics have said the clean energy generated by Ivanpah will cost about four times as much as the electricity generated by conventional natural gas-fired plants. Animal activists have also been alarmed by the number of birds that have been scorched and killed around the solar plant towers, which can generate temperatures as high as 1,000 degrees Fahrenheit.